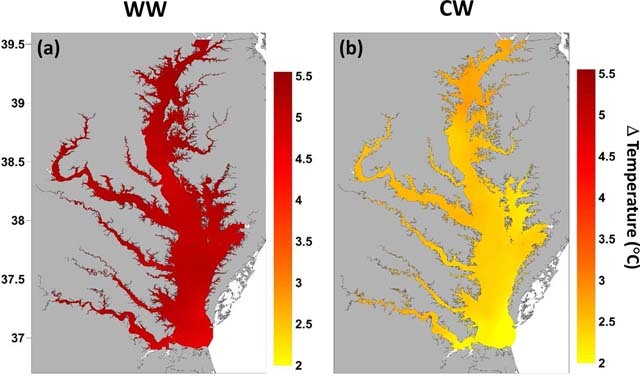 Potential salinity and temperature futures for the Chesapeake Bay using a statistical downscaling spatial disaggregation framework. The authors developed future scenarios of temperature and salinity for a highly productive and economically important coastal environment, the Chesapeake Bay, which provides crucial nursery and adult habitat for multiple economically vital fish and invertebrate species. Even large estuaries like Chesapeake Bay are poorly resolved in global climate projections. They are, however, well sampled. The authors thus developed a data-driven statistical downscaling approach to successfully predict estuarine temperature and salinity from larger scale climate properties. Projections, from global climate models representing a wide range of potential futures, suggest water temperature increases of 2-5.5°C (3.5-9°F) by the end of the 21st century, under a high greenhouse gas emissions scenario (RCP8.5). Future salinity changes were less certain, with some global climate models supporting a freshening in response to increased river flow and others suggesting more salty conditions. The approach does not yet resolve the effect of sea level rise, which could lead to saltier conditions near estuary mouths. Estuaries are very important to coastal communities, both socially and economically. Estuaries are also essential links in the life cycles of numerous ecologically and economically important marine and freshwater resources. This research highlights potential future changes to the Chesapeake Bay estuarine environment. In particular, the authors look at how climate change may impact Chesapeake Bay temperature and salinity, properties that exert strong controls on marine resource habitats, as well as migration, spawning phenology, recruitment and occurrence of pathogens. Even large estuaries like Chesapeake Bay are poorly resolved in global climate models. They are, however, often well sampled relative to oceans. The Chesapeake Bay has benefited from numerous multi-decadal observational programs that provide information about how local environments respond to large-scale climate conditions. This study, done in collaboration with NOAA’s National Ocean Service, leveraged this observational resource to develop a data-driven approach for inferring the response of Chesapeake Bay surface temperature and salinity to large-scale climate forcing. This data-driven “statistical downscaling” approach was applied to estimate the potential salinity and temperature changes across Chesapeake Bay for climate models spanning a range of projected climate futures under a greenhouse gas emissions scenario. All models projected a significant warming across all regions of the Bay. Warming patterns were spatially uniform but varied between 2°C (3.6°F) for models with the weakest atmospheric warming to 5.5°C (9.9°F) for those that warmed the most. Projected salinity changes, however, were less certain. Some climate model projections suggested a freshening in response to increased rainfall and river flow, while others suggested more salty conditions and decreased river flow. Improved regional hydroclimate projections are needed to resolve this uncertainty. Future studies will also more closely consider the effect of sea level rise (SLR). SLR could lead to saltier conditions, particularly near the Chesapeake mouth. We are presently using the projections developed in this paper to assess the potential impact of climate change on bacterial pathogens (Vibrio vulnificus and Vibrio parahaemolyticus) in Chesapeake Bay that pose a threat to human health and the shellfish industry. This study is a “proof-of-concept” that could be extended to other well-observed estuaries and make predictions across seasonal to century time-scales. Expansion to other systems is aided by the low computational cost of statistical approaches, but the viability of the approach depends critically on the availability of long observational time-series to build and test statistical relationships between large-scale climate and local responses. Projected changes in surface temperature in the Chesapeake Bay from the “Warm Wet” (a) and “Cool Wet” models (b) during summer: 2071–2100 minus 1970–1999, averaged across all downscaling methods. The two GCMs shown had the smallest and largest changes in temperature of the four considered.